For people of a certain age, the mere sight of a record player is enough to evoke a deep sense of nostalgia as memories of the good old days come flooding back. But keep your shirts on audiophiles, it’s not yet time to get a tattoo of that traditional vinyl player just yet. Because guess what? These babies aren’t going anywhere anytime soon. Well, the traditional models may not be in circulation today, but the modern turntables can still roll back the yesteryears without losing that X factor. And the best thing is? There is much more to them than just a sense of reminiscence. Investing in a record player today will not only grant you access to your favourite tunes in uniquely superb audio quality, but physical records are still a great avenue to support artists and record stores. When shopping for the best record players under £100, one key thing to consider is whether you want the system to come as a single machine that bundles the turntable, amplifiers and speakers, or to have them as separate components. Something else to think about are any extra features you may be interested in – whether the turntable can be used to DJ, for instance, the option to record to PC via USB and of course, the issue of portability. Obviously, record players under 100 quid don’t come with many bells and whistles, but who said you have to drop major coin to get a good player? We scoured the web for the best record players on the market today, and here are great budget players under £100 that guarantee great service. USB record player - As a USB record player and simply connects to your PC via USB cable. Use the included software to record and convert your records to MP3 or WAV. Stylish - Vintage styled stand-alone vinyl record player. Briefcase / suitcase design for easy portability and stylish looks. Three speeds - Adjustable to play 33 1/3, 45 or 78 RPM records. One year warranty guaranteed. If it has problem and doesn't work, support return and 100% refund. The DigitNow retro record player is a device that does a good job of upholding the classic look and feel of a traditional turntable. It features a few modern upgrades and nothing more. While this may sound a bit under par, the attempt to keep it real is exactly what endears this player to many buyers, and you don’t need to venture further than look up the overwhelmingly positive reviews the player is garnering on Amazon. The DigitNow retro record player comes in an elegant vintage-styled briefcase, complete with a leather-look finish and chrome-shaded fasteners, all which serve to breathe an old school vibe into it. The briefcase allows for easy portability and you can be sure this turntable will earn you some positive points wherever you go. This is a three-speed record player capable of playing any vinyl. It can switch between 33 1/3, 45 and 78 RPM records, so there are no worries about any lack of support for your record collection. One of those notable modern features we just alluded to is USB connectivity. The presence of a USB port means you can tether the turntable to your computer, a capability that allows you to record and convert vinyl to WAV or MP3 format. It carries its own USB cable. The DigitNow three-speed turntable features stereo phono outputs on the rear that allow for fast and easy connection to your home stereo. It has a set of stereo speakers at the front which provide surprisingly quality sound. The RCA out (3.5mm phone jack) gives you the option to connect to your headphones or stereo system for when you prefer more boom or better sound. A mains power cable and CD with Audacity audio software and manual fill the rest of the package. The DigitNow three-speed turntable retro record player comes in three shades: a Black and Red, a Blue, and a White. For its price, you will have to look far and wide to find a record player that can rival this mean guy. 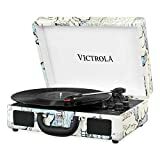 Victrola is a well-established name in the turntable and record player industry, with a product to suit every pocket. 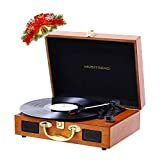 It is therefore not surprising to find them in the best record players list, and they make their entry with this entry-level suitcase turntable that is capable of playing 33 1/3, 45 or 78 RPM records. The compact three-speed record player is pretty bare-bones as you would expect with any portable. It is housed in a lovely suitcase that comes in four colour options – Black, Retro Map, Turquoise and UK Flag. The suitcase is secure and durable, with a design that makes it easy to handle. The Victrola 3-Speed Bluetooth Suitcase does not have any battery capabilities. This is a bit of a shame really considering you need to have it hooked to a power source. Other than that, though, it promises most else of what you would desire in a record player of this standard. Notably, it boasts Bluetooth connectivity which lets you play music wirelessly from all your Bluetooth-enabled audio devices, allowing for a radius of 33 feet. The 3.5mm Aux-in jack makes it possible to play music from your phone, MP3 player or tablet. An RCA Out allows you to plug in headphones or connect a stronger set of speakers. It has built-in speakers as well. On the downside, the sound has been faulted for being a bit tinny especially when playing on high volume, but overall, it’s a decent record player at a decent price. A quick glance at the Numark PT01 Scratch and one obvious thing you notice about it is the throwback look which conjures memories of the LP players of old. Numark wants you to feel just that and they have a particular target client in mind: DJs and anyone else with a proclivity for turntabling. The Numark PT01 Scratch is a portable turntable equipped with an integrated fader switch that allows deejays to take their turntablism wherever they go. One of the beauties of this record player is it simplifies the job a lot for anyone interested in getting in on the on-the-go turntablism. It achieves that by bundling all essential components into a single unit rather than have them as disparate parts. The player comes with a Numark-exclusive scratch switch attached that can be adjusted to suit both left- and right-handed individuals. Conveniently placed RCA outputs make it easy to connect to external speakers and the system boasts, not one, but two headphone outputs. Then there is a mini or 1/8th inch Aux input that can connect to portable devices such as phones, tablets and external amplifiers. The Numark PT01 Scratch is battery-powered and runs on six D-cell batteries. This means you can scratch from anywhere without relying on an external power source. The record player also comes with an AC wall adapter for plugging into wall outlets. By pushing this as a portable turntable, Numark was thoughtful enough to throw in trivial nuances such as the sleek red handle that makes transportation even easier. Some may bemoan the mostly plastic construction, but for a unit designed for high mobility such as this, the hard casing plays the crucial role of safeguarding the contents inside. What’s more, the PT01 Scratch record player is shipped with extras that include a removable slip mat, cartridge and protective dustcover. Did we mention it provides for USB connectivity? All that is lacking are some good vinyls to bring it to life. But we assume you have a good selection of those. 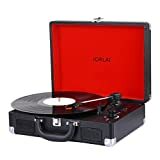 Another record player under 100 pounds you need to consider is the Jorlai suitcase turntable record player. And here’s why. This record player is constructed from wood (a plus) which has then been draped in PU leather. Despite this, the player has managed to remain lightweight to facilitate easy transportation which is aided further by the presence of a handle. The Jorlai three-speed turntable features a modern design with retro technology. It has three selectable speeds and the 45-RPM adapter is designed to work with 12-, 10- and 7-inch vinyl records. It ships with a software CD which you can use to convert audio from vinyl into WAV and MP3 formats which you can port to your computer or smartphone. This record player allows for Bluetooth connectivity so it is possible to connect it to your phone or laptop. The connection can also be done via the provided 3.5mm cable. A built-in battery means you can play your turntable alfresco. You can squeeze about two hours out of it without being connected to an AC mains. What’s more, the product comes with a 12-month warranty and the manufacturer pledges unlimited customer support service. Portable Design---Just like a suitcase,it can be closed up and taken on the go, thanks to its secure clasp and easy-carry handle. Stereo Speakers---Built-in two high-quality stereo speakers, so you can enjoy your music anywhere, without carrying additional speakers. Autostop Function---In case you think you might fall asleep while listening to some relaxing tunes, you can turn the Autostop on. This will make the platter stop spinning when it reaches the end of the record. 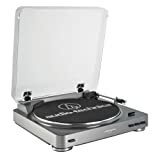 Multifunction---3.5mm Aux-in for playing music from any non-Bluetooth device, RCA Aux-in and headphone jack.Three-speed turntable (33 1/3, 45, 78 RPM) plays all of your vinyl records and favorite albums. PC Encoding---Connects to computer vis USB and converts records into digital music files. The Musitrend Bluetooth turntable is another compact record player equipped with a slew of features. Bluetooth support is one of the standout features, which means you can wirelessly stream music to your stereo system or other Bluetooth-enabled audio devices. The feature has some voice responses which you might find startling initially, but you will get the hang of it over time. The record player features an RCA 2-channel connection at the back which can also be hooked to an amplifier, larger speakers or external stereo system. Headphones are also supported. This is another system with the capability to convert your vinyl music into MP3 and WAV formats for later playback on your digital devices. When it comes to aesthetics, this model veers more to the conservative side – not that this is a bad thing. Matter of fact, its colour combos do give the turntable an edge. It comes in three models – White, Wooden and Black & Red. It has a briefcase design which makes it easily portable. In addition to a 12-month warranty from the manufacturer, you are also eligible for 24-hour customer support – with one replacement stylus needle to boot. Audio-Technica is a behemoth in the sound equipment department and is particularly known for their top-notch headphones and microphones. They also do make some pretty solid turntables. Problem is, most seem to breach the 100-pound mark, unless you wake up on a lucky charm and happen across a good deal going. But if you can stretch your budget by a few quid, you can own perhaps the closest thing to a legit mid-range record player while operating within the confines of £130. The AT-LP60 record player is a little box of muscle that focuses directly on the music. It gives you full automatic operation, and what this means is you simply press a button and the tonearm cues up the first jam. Once the record is done playing, the tonearm resumes back to its rest position automatically. The Audio-Technica AT-LP60 is a two-speed record player capable of playing 33 1/3 and 45 RPM records. It has a built-in amplifier and delivers great sound quality. However, it does not have built-in speakers and has to rely on powered externals. The workaround to this is investing in either of its two upgrades – the AT-LP60 Bluetooth (which can connect to speakers wirelessly) or the AT-LP60 Bluetooth with Speaker which comes with a smart external speaker on the side. But either of these options will mean digging deeper into your back pocket. The Audio-Techica AT-LP60 is fitted with a removable dust cover (hinged) that can be closed even as a record plays, although a briefcase for simple transportation is conspicuously missing. While these downsides may sound a tad much, they hint at why this is probably the best system you’ll fetch at this price range – and all these are just but the essentials you have to forego in exchange for the excellence.